Driving down the road on my way to work, I start switching stations trying to find something to listen to. A classic rock station comes in and “Stairway to Heaven” is playing and I am satisfied, because it is old and familiar (in addition to being a damn good song). The Swayback’s newest album, Double Four Time, has a very similar feel as well. It’s a feeling that makes you think, “I love this song”, even though you’ve never heard it before. 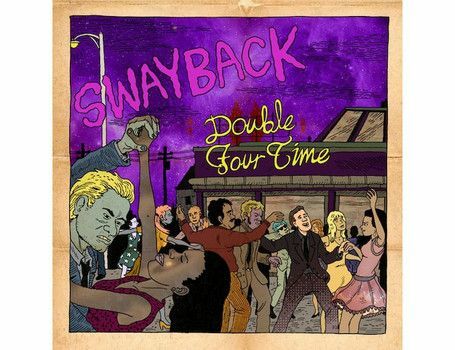 The swayback has excellent musicians mixed with creativity and power. The first track on Double Four Time is entitled “What Death Cares About”, and it is a great example of that mixture. It begins with a Caribbean island lazy day atmosphere, which quickly turns into a much more powerful and emotional chorus. The guitar solo is the icing on the cake for this song, being that it makes the track go from tasty to delicious. The savory guitar playing continues throughout the album, reminiscent of the British rock of the 60’s and 70’s. “Lost Lake Woods Club” is another excellent track on this album, due to it’s obvious bluesy feel. This bluesy feel continues throughout the verses, but another transformation happens towards the end of the song. An array of sounds ranging from dark to happy or heavy to light creates a chaotic atmosphere before ending. The singing on Double Four Times is pure quality with a dark, almost sarcastic tone that is mixed with creative lyrics. This mixture has proven to be an integral aspect of the music and the atmosphere created. “Mojave” is a fantastic track that places a little panic in the mind of the listener by proclaiming,” go, go keep running. The invisible man keeps coming” repeatedly. This, coupled with the dramatic shift in gears to a much more worrisome feel, generates a feeling of helplessness. The ability to take listeners through emotional roller coasters is an under-rated attribute to music. The Swayback not only has this ability but they take full advantage of this ability. The pure talent of the band is what is most impressive about The Swayback. The instruments are played with such skill and confidence that there is no mistaking them as mediocre musicians. Double Four Times is their newest album that dropped in July. This is an excellent buy for the experience of 45 minutes of new familiar music.